Introducing the only change bag you will ever need! Why not use it for your new-borns hospital bag too?! 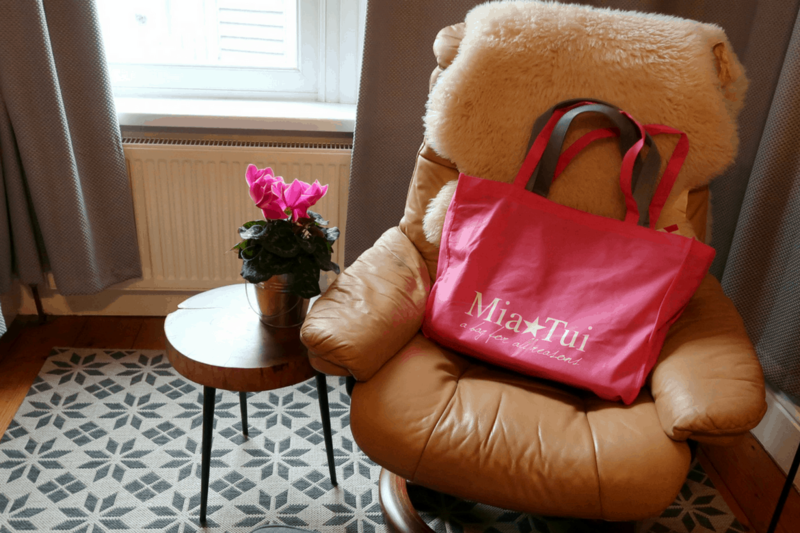 A perfect choice for a gift the bag arrives in a pink reusable fabric bag, perfect to fold up inside your Mia Tui and take to the shops. For a fashion focused mama it is perfect, looking more like a designer handbag than a changing bag, although that said it doesn’t lack on practicality. The product has been carefully designed so that it offers everything! Included in the change bag is a clear make up zipped bag, clutch and unique changing mat with handy nappy pockets. Let’s face it we carry a lot around with children so a bag needs to stand up to this challenge! The compartmented areas offer plentiful space for wet wipes, an insulated bottle holder section, spare clothes and all your personal items. The organised design means no more rummaging round in a panic for lost lipstick. It really is a ‘bag for all reasons’. I was really impressed by the inclusion of different straps, shoulder, wrist, buggy clips; you will not be wanting or wishing for anything else. The zipped pocket on the outside is perfect for keys, or a phone. The shade is a perfect purple grey made of wipe able ultra-soft faux leather. The inside is a bright pink which compliments the grey and the bag itself pairs a range of outfits. Waterproof inside and out this bag can go everywhere with you and your little one. The website offers a stunning range of bags that are multi-purpose; they look good. Really good. I am in love with this bag and any am sure if anyone purchased an Emma, or any bag from the range they would not regret it! What do you look for in a change bag? Size, weight, design? Note: We were kindly offered a bag for a giveaway in return for our honest review. With my first, I just had the freebie bag that Boots give away…. it did the job…kinda… but for my 2nd I’m definitely looking to treat myself to an upgrade! This is just so… stylish? And doesn’t scream ‘I’M FULL OF NAPPIES AND THE WOMAN HOLDING IT IS SLEEP-DEPRIVED’, which is always a bonus….